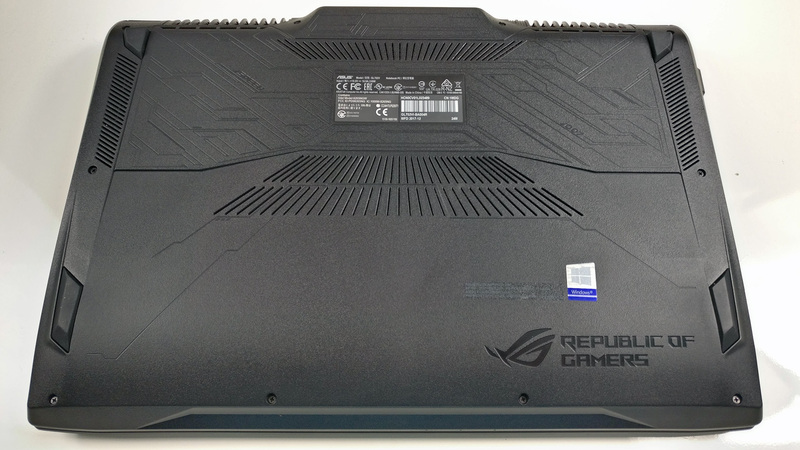 The ROG Strix GL702VI may be ASUS’ current top-tier gaming notebook with the most powerful GPU on a laptop from NVIDIA but it fails to impress in almost every other aspect while carrying a price tag similar, or even higher in some regions, to its direct competitors – Acer’s Predator 17 X and Alienware 17 R4. 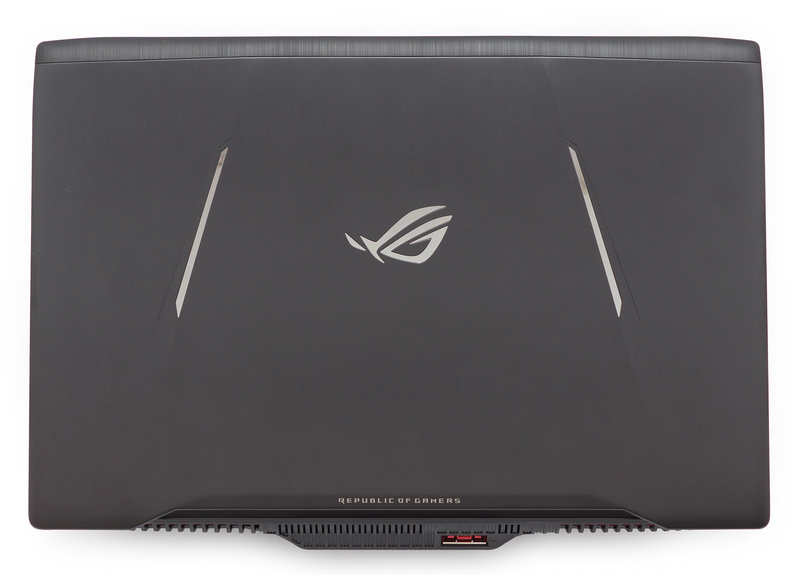 Both notebooks have been on the market for quite some time and offer top-notch premium experience so it’s not going to be an easy task for the ROG Strix GL702VI to overtake its rivals. Even though the laptop sports the latest of what Intel and NVIDIA have to offer, the demanding PC enthusiasts will be disappointed to see that configurations exclude the overclockable Core i7-7820HK from specs list, which is a big surprise since the ASUS ROG G701VI runs on it while Acer’s and Alienware’s alternatives also offer the Core i7-7820HK option. However, we expect ASUS’ variant to offer overall better Full HD IPS display with 120 Hz refresh rate compared to the 120 Hz VA panel on the Alienware 17 R4 and the 75 Hz IPS screen on the Predator 17 X (GX-792). But what about cooling and overall gaming experience? We find out in the thorough review below. 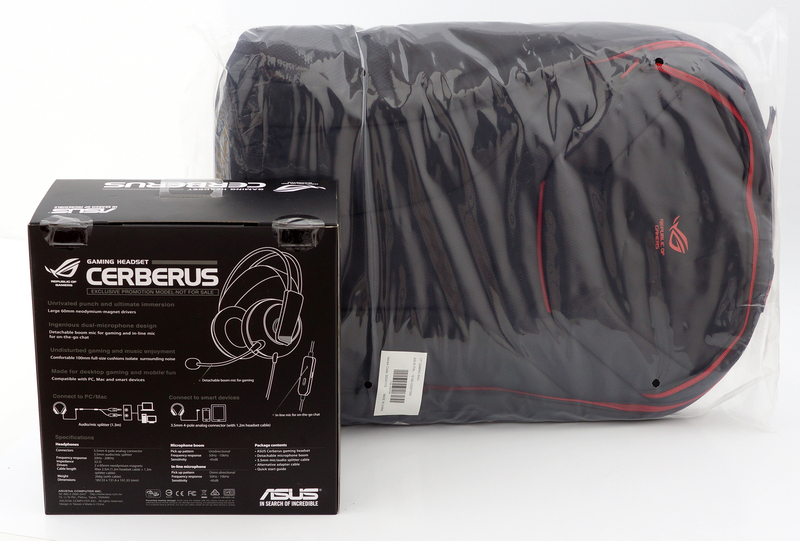 The notebook comes in a big box containing the huge power brick, power cord and some promotional extras like a gaming headset, carrying bag and a gaming mouse all of which are ROG-branded. We are unsure, however, if these accessories are available worldwide or just in selected regions. Unfortunately, the GL702VI isn’t anything special in terms of design. 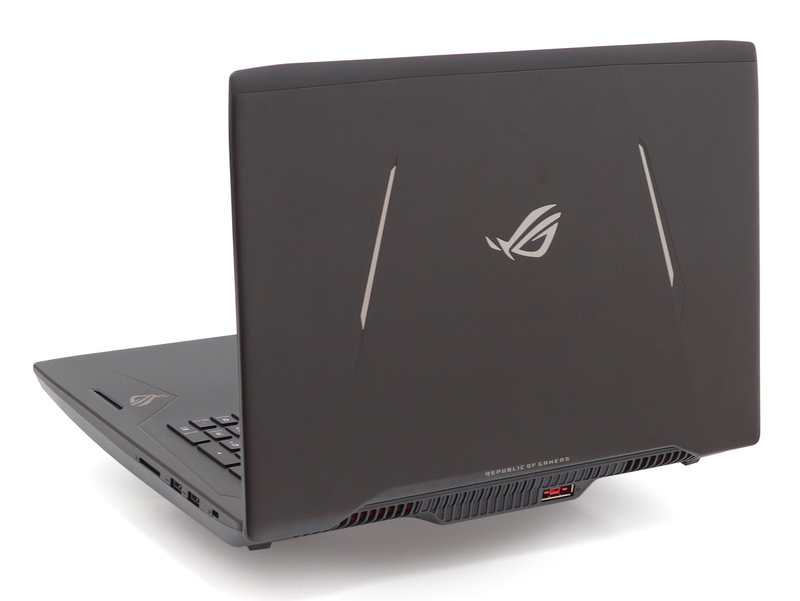 In fact, it looks a lot like the mid-range ASUS ROG Strix Gl753VE so we would have been a good idea for ASUS to distinguish its high-end laptop from its low-end configurations a bit better. But the design isn’t the only thing all GL notebooks share – the choice of materials is largely the same as well. 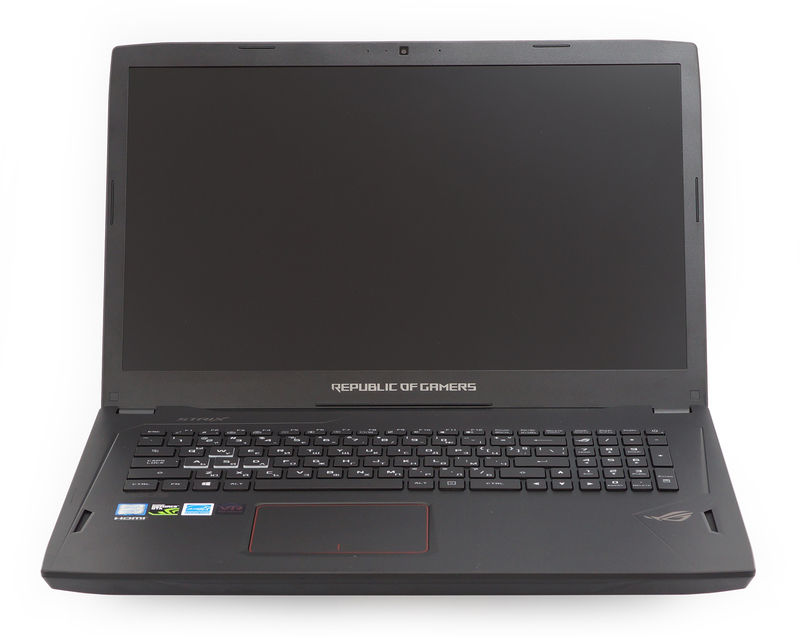 Just like the rest of them, the GL702VI features a brushed aluminum lid and all-plastic base. Normally, this isn’t an issue when you are paying around $1 000 for a gaming laptop but becomes on when you are charging a price premium while aiming at customers demanding high-end gaming experience. On contrary, the Predator 17 X and the Alienware 17 R4 boast more sophisticated build that includes matte plastic finish that feels great to touch and metal inner layer that adds rigidity. In any case, the build quality of the GL702VI isn’t bad by any means. We didn’t find any inconsistencies and protruding or sharp edges. The flex was virtually non-existent around the keyboard area or the palm rest. 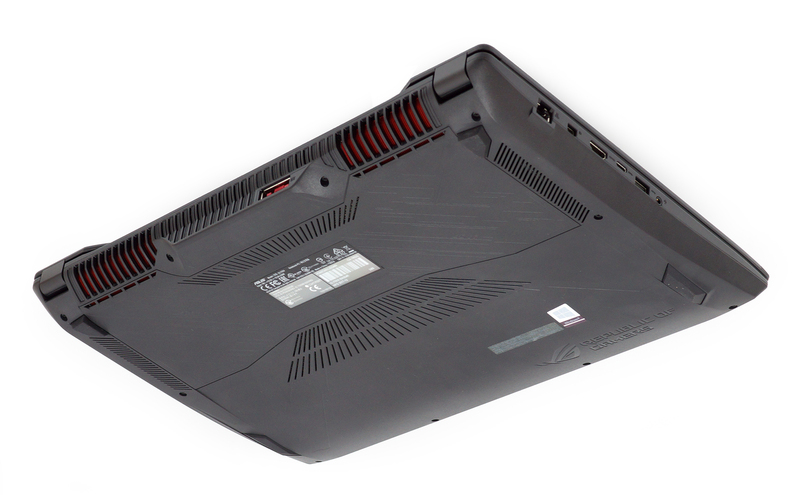 The lid stood strong during our twisting and bending attempts as well but we just couldn’t get past that prominent “cheap” notion – the bottom of the laptop is made of hard, slightly roughened plastic while the interior features plastic that imitates brushed aluminum. However, fingerprints stick on the surface just as easily as on the matte finish. 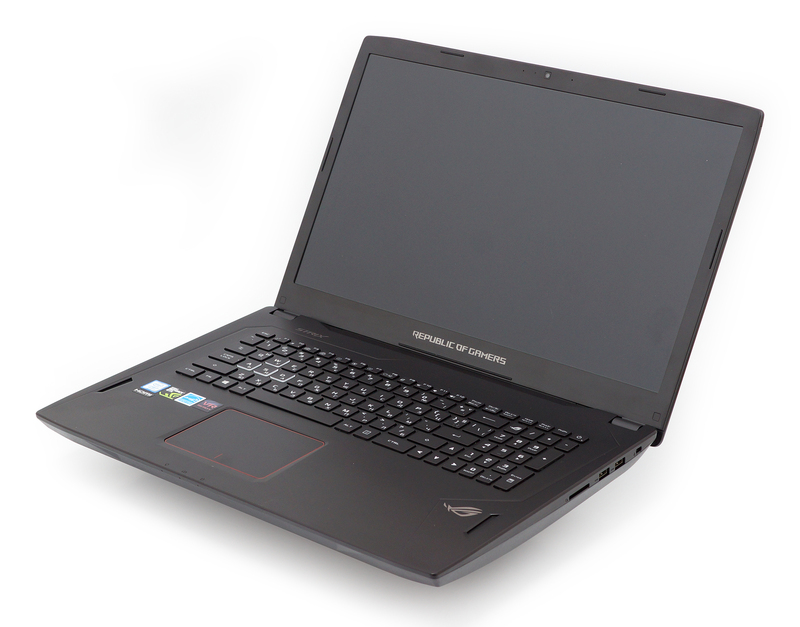 In terms of portability, however, the GL702VI impresses with relatively low weight. Tipping the scale at just 3.24 kg, the GL702VI easily becomes the lightest GTX 1080-powered we’ve tested and actually seen. It beats MSI’s TITAN PRO, Acer’s Predator 17 X and Alienware’s 17 R4 by more than a 1 kg. Thickness, however, isn’t exactly its strongest suit but stays within normal range for a notebook like this – 41.5 mm. The Alienware keeps its top spot in this regard. The input devices on this thing fit well with the overall design – they are not special by any means. 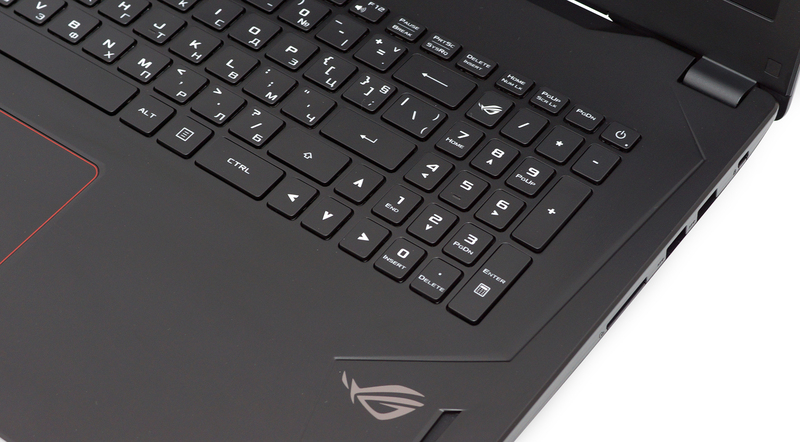 The keyboard’s design is more or less familiar and can be found across all GL-branded ROG Strix laptops but ironically, the low-end GL553 and GL753 configurations received the best version with longer key travel. The one presented here has nice and clicky tactile feedback and just enough travel for typing but we doubt all gamers will appreciate the shallow nature of the keys. Also, the arrow keys are a slightly narrower than they should and aren’t well-separated. The 4-zone RGB LED backlight, on the other hand, is discreet and doesn’t distract you. Once again, the keyboard isn’t bad by any means it’s just that it’s not entirely gaming-centric. Luckily, the touchpad compensates… to some extent. It’s responsive, accurate with a tad stiffer mouse clicks and it does the job pretty well on the go. Nevertheless, it’s a bit wobbly at times – feels like it has two-level click mechanism and also a tad sluggish. In any case, we prefer the dedicated mouse buttons design that’s been around for quite some time on the high-end ROG laptops and its rivals. Even though the bottom piece doesn’t feature service lids for easy access to some of the internals, the plate comes off easily and you can upgrade, clean or repair with virtually no hassle. 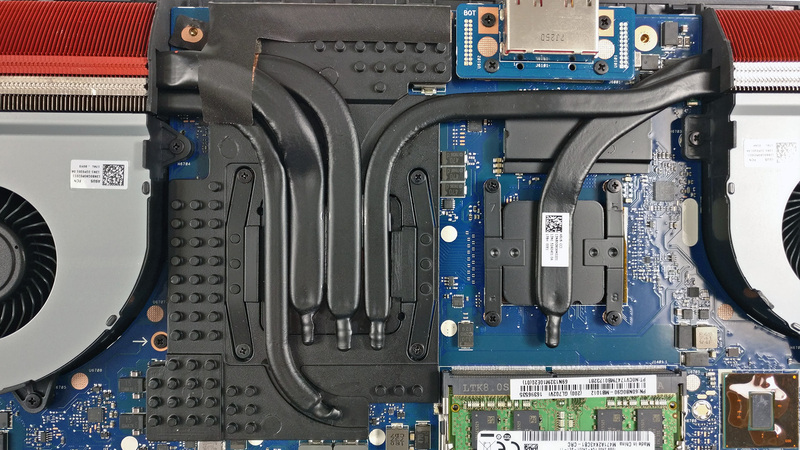 Of course, the laptop comes with an M.2 PCIe NVMe-enabled SSD slot and a standard 2.5-inch drive bay. 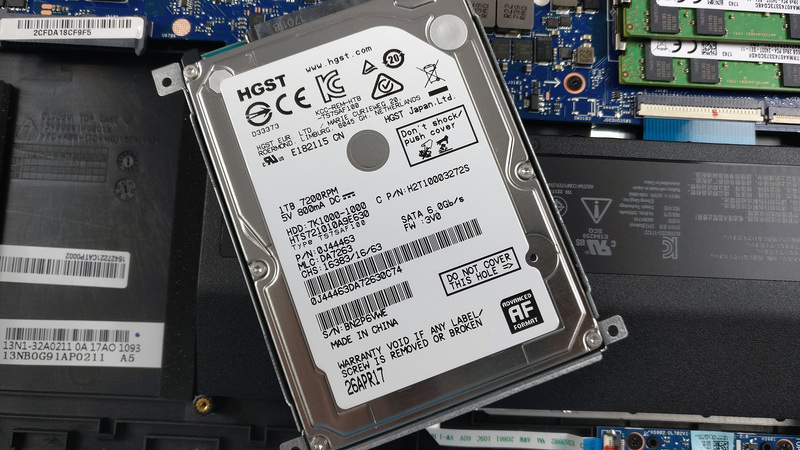 The former is taken by a Samsung PM961 PCIe NVMe SSD with 512GB capacity while the 2.5-inch HDD is HGST 1TB spinning at 7200 rpm. Of course, depending on your configuration and region, the storage devices may be different. 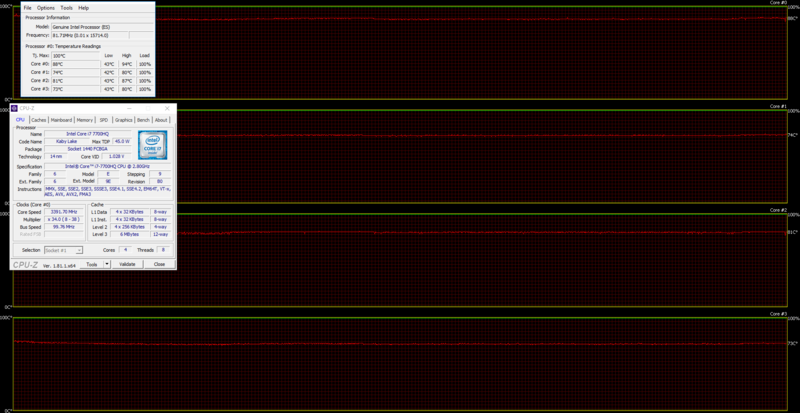 Even though this is enough for most users, we can’t miss the fact that the Alienware 17 R4 and the Predator 17 X have two M.2 PCIe NVMe SSD slots configurable in RAID 0. 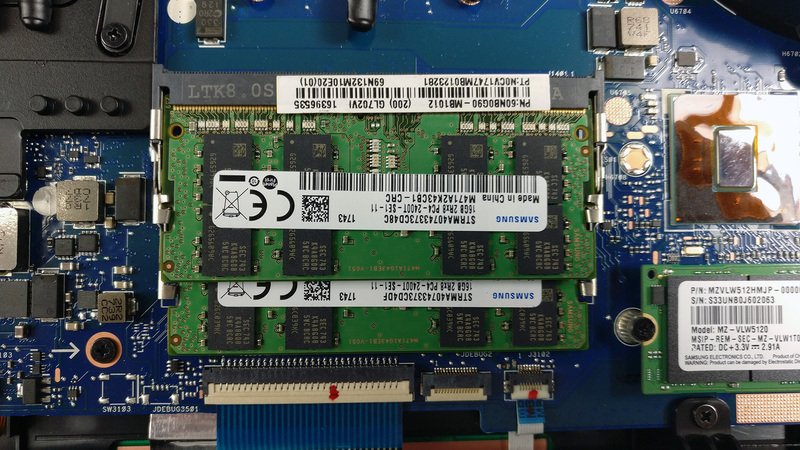 The unit we’ve tested came with the maximum allowed memory – 32GB of DDR4-2400 RAM using both of the available slots. 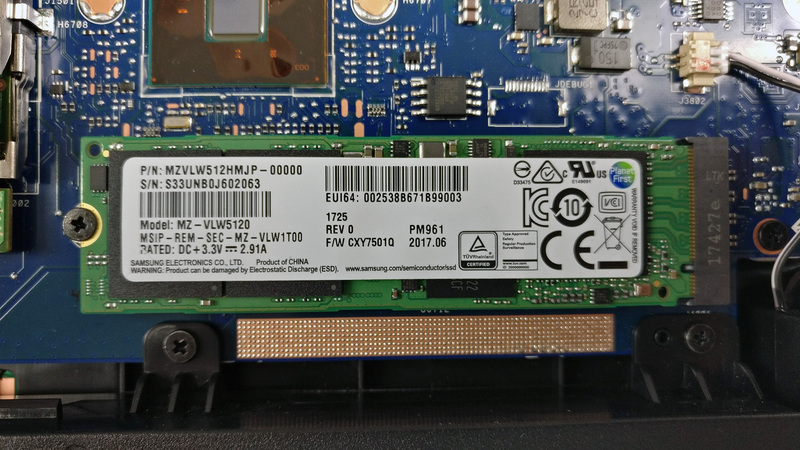 The chips we found were Samsung 16GB DDR4-2400. 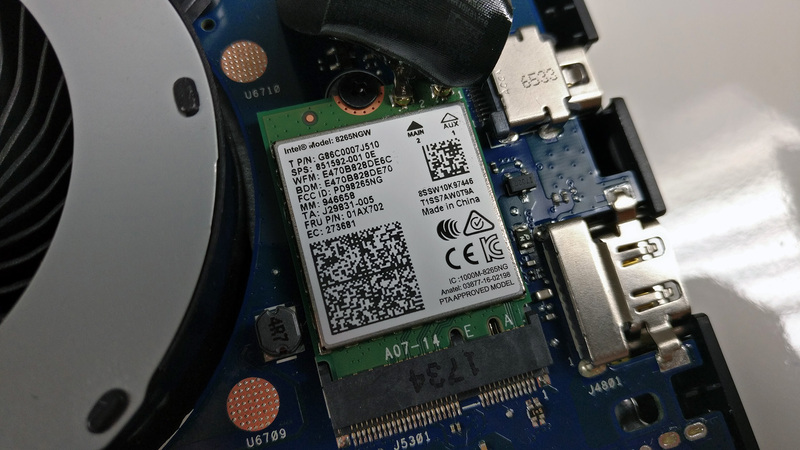 The Wi-Fi is located near the cooling fan and it’s Intel 8265NGW. 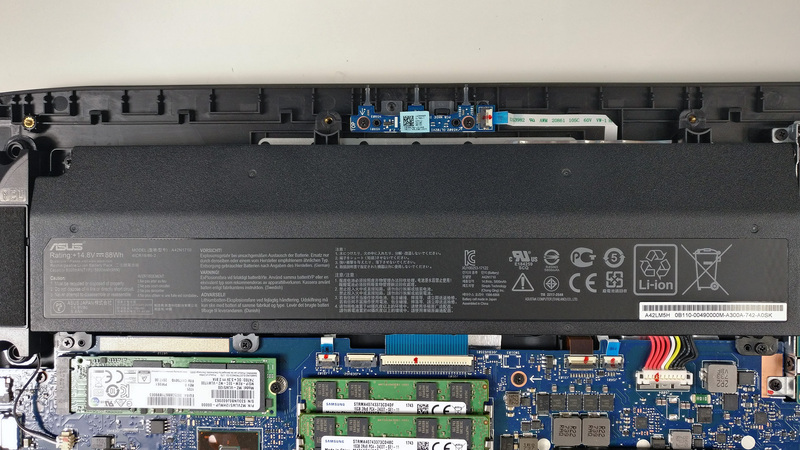 The battery unit is located under the wrist rest area and it’s rated the whopping 88Wh, although we doubt this will be enough to reach some significant web browsing and video playback runtimes. 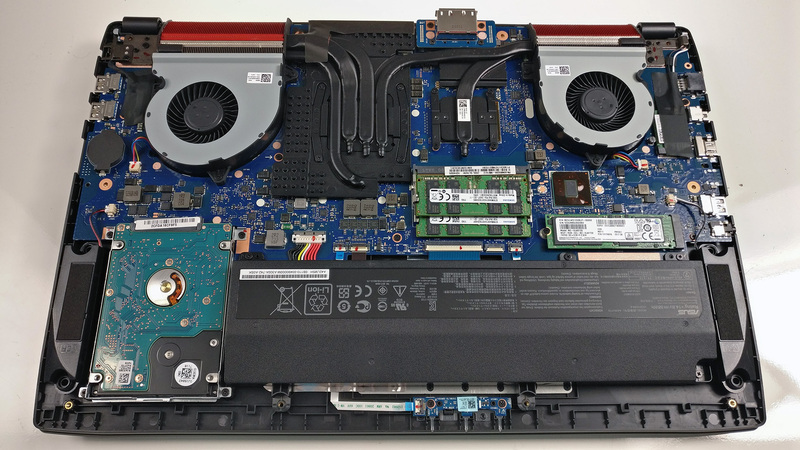 At first glance, the notebook’s cooling solution appears to be pretty solid – two dedicated heatpipes and a huge heatsink take care of the GTX 1080 while the CPU relies on just one but thick enough heatpipe and a relatively big heatsink. There’s also an additional heatpipe coming from the right cooling fan (with the bottom of the notebook facing upwards) that takes some of the heat away from the GPU. Probably the strongest selling points of the GL702VI is the display. Featuring a Full HD (1920×1080) IPS panel supporting G-Sync and 120 Hz refresh rate, the AUO B173HAN01.1 is not only suitable for gaming but for multimedia as well. And as usual, due to the 17.3-inch diagonal, the screen has 127 ppi, 0.1995 x 0.1995 mm pixel pitch and can be considered as “Retina” when viewed from at least 69 cm. We’ve recorded a peak brightness 316 cd/m2 in the center of the screen and 309 cd/m2 as average across the surface with just 10% maximum deviation. The correlated color temperature at maximum brightness is a bit colder than it should be – 6890K and gets closer to the optimal 6500K when going along the grayscale. You can see how these values change at 140 cd/m2 (36% brightness) in the image below. The maximum color deviation dE2000 compared to the center of the screen should be no more than 4.0 and if you are planning to do color-sensitive work, it should be lower than 2.0. But in this case, since the laptop is going to be used mostly for gaming and multimedia, a deviation of 3.3 in the lower left corner isn’t going to be an issue. 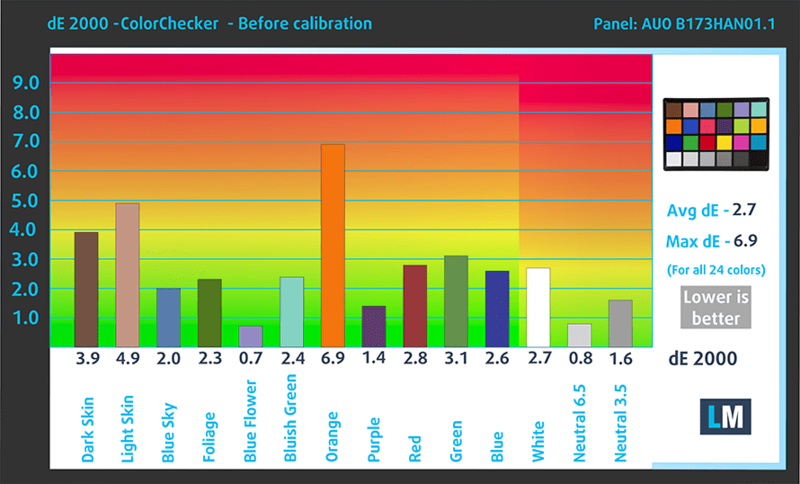 The contrast ratio is exceptionally high – 1400:1 before calibration and 1380:1 after calibration. In this case, the display covers 90% of the sRGB color gamut making it ideal for multimedia and gaming. Colors will appear vibrant and mostly accurate. As expected, just like 99% of the G-Sync-enabled displays, this one doesn’t use PWM for regulating brightness as well. 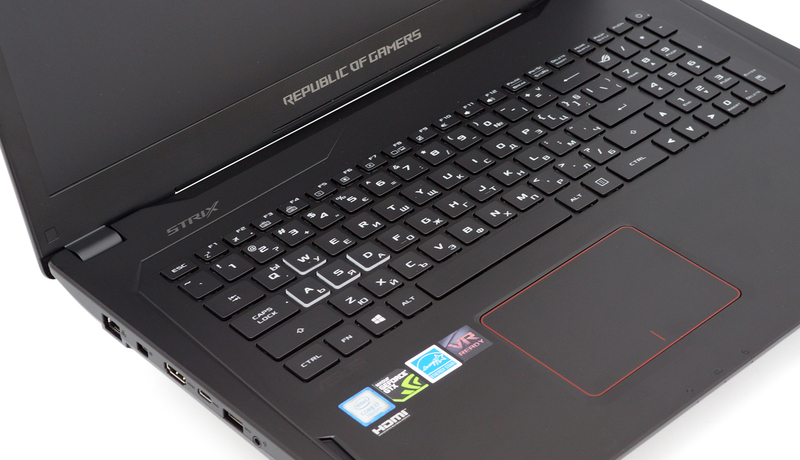 One of the best displays we’ve tested on a gaming notebook. It checks all the boxes – wide sRGB coverage, high contrast, high maximum brightness, no PWM, supports G-Sync and has fast 120Hz refresh rate. On top of that, the display is pretty well calibrated but if you still want the best possible experience, our profiles will fit perfectly. The stereo loudspeakers provide good sound quality with clear low, mid and high frequencies. Obviously, battery life isn’t one of its strongest suits for apparent reasons. 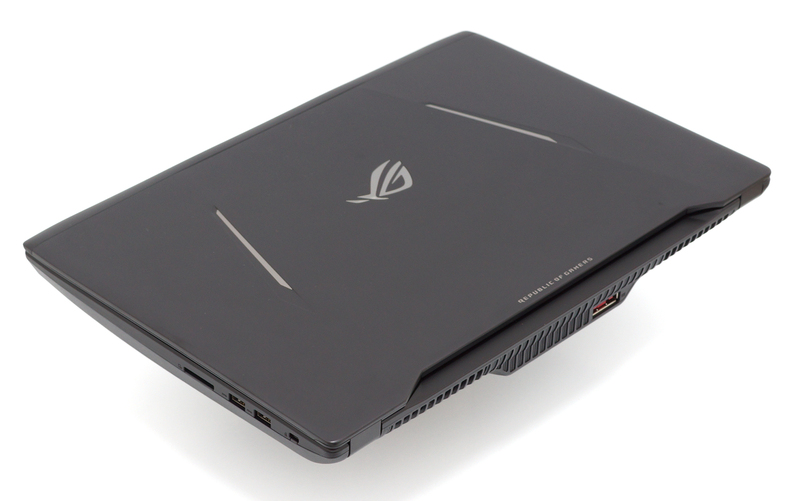 Like all high-end gaming laptops, the ASUS ROG GL702VI doesn’t use the integrated graphics for light tasks such as video playback and browsing because NVIDIA’s G-Sync feature still doesn’t support switchable graphics so the GTX 1080 has to do the heavy lifting along with the undemanding tasks. And as you can see from the results below, huge 88Wh battery just isn’t enough to deliver good runtimes. Here you can see an approximate comparison between the CPUs that can be found in the ASUS ROG GL702VI models on the market. This way you can decide for yourself which ASUS ROG GL702VI model is the best bang for your buck. Fritz is a chess benchmark that tests the computing capabilities of the CPU with various chess moves. The Intel Core i7-7700HQ scored 13.637 million moves per second. In comparison, one of the most powerful chess computers, Deep(er) Blue, was able to squeeze out 200 million moves per second. In 1997 Deep(er) Blue even beat the famous Garry Kasparov with 3.5 to 2.5. 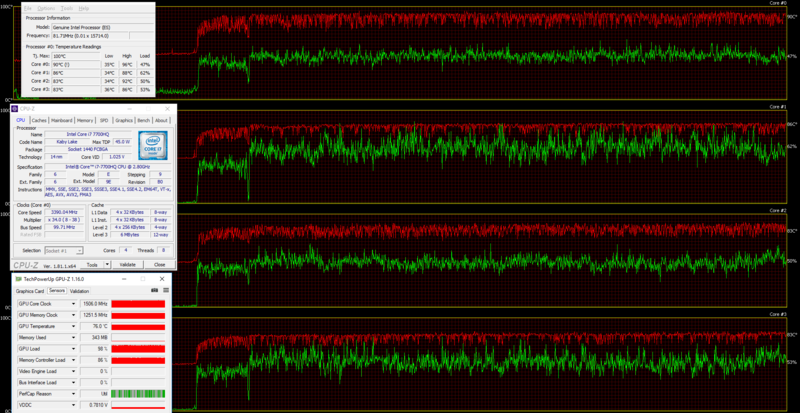 We rant the CPU stress test and didn’t notice anything out of the ordinary – the Core i7-7700HQ ran at its maximum frequency for four active cores (3.4 GHz) and temperatures were pretty stable as you can see from the screenshot below. However, the cooling fans were pretty loud even though we still haven’t started the GPU torture test. As expected, the combined stress test raised the CPU temperatures a little while the GPU remained at around 76 °C during the whole test – an impressive result. The Core i7-7700HQ utilized the maximum clock speeds of around 3.4 GHz while the GTX 1080 ran at stable 1500 MHz – just a tad lower than its base operating frequency of 1566 MHz. Also, keep in mind that the cooling fans got even louder once we ran the combined stress test. Temperatures on the surface remained pretty stable and surprisingly cool. The only warm spot was the center of the keyboard but still pretty negligible. This is due to the cooling design – the system draws cool air beneath the keyboard so it doesn’t allow the surface around it to heat up and compensates for the lack of bottom grill. Top-notch gaming performance but not the best possible user experience overall for sure. 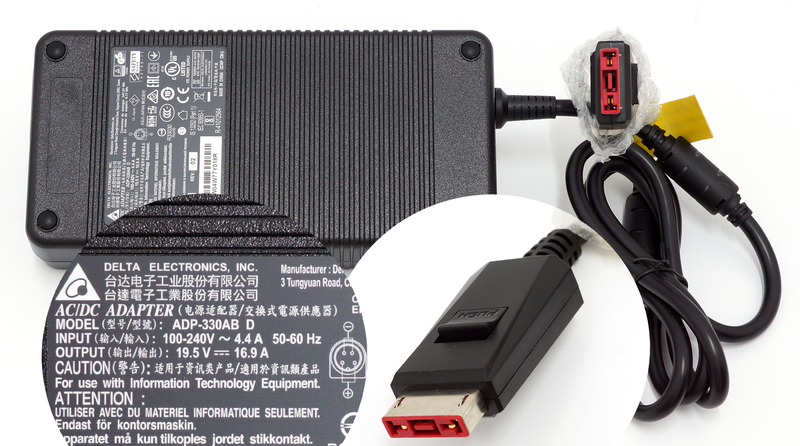 That’s our summarized opinion of the GL702VI and we will try to break it down a bit. Playing in the same ballpark as the Alienware 17 R4 and the Acer Predator 17 X in terms of pricing and performance, there’s a lot to be expected from the GL702VI. 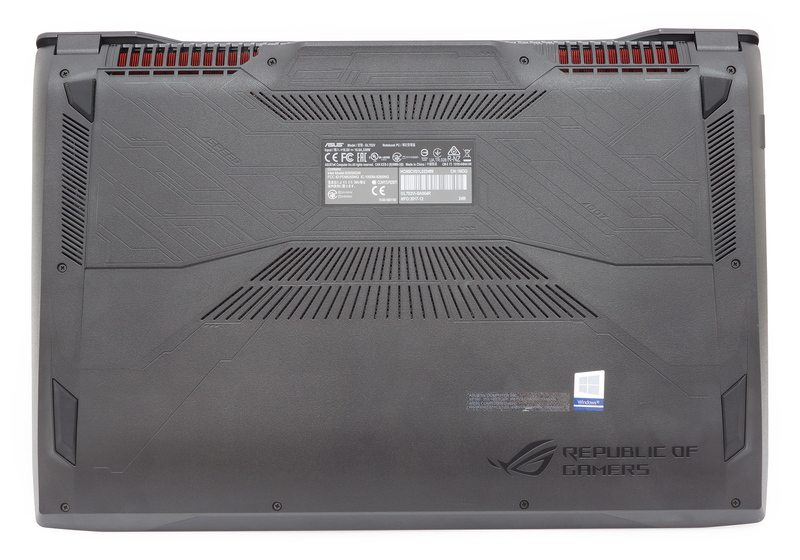 And ironically, ASUS has made some rookie mistakes with the current GTX 1080-powered laptop while not so long ago, ASUS was releasing one of the most renown high-end ROG laptops. So what happened? 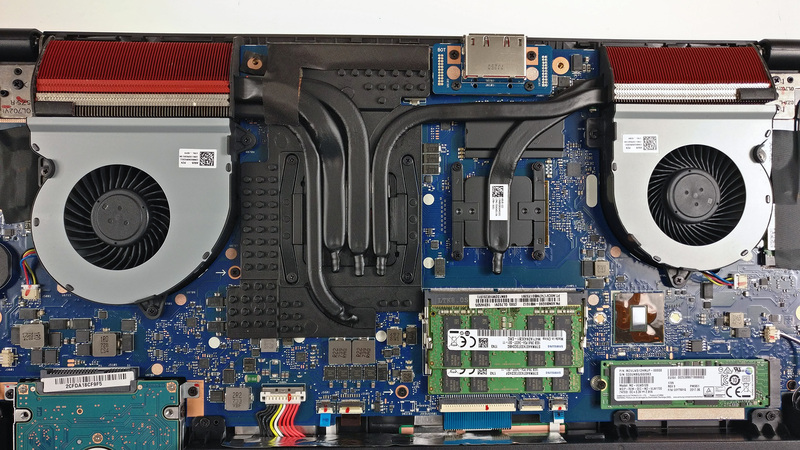 By the looks of it, the OEM tried to cut on some of the corners to get a better margin while still focusing on some of the key aspects that make a gaming laptop good. This way it can still offer some good selling points compared to its competitors but we still think it’s not the best possible choice overall. So here’s why. Build materials are definitely sub-optimal giving you that cheap feeling and kind of outdated looks with plastic covering 90% of the whole chassis but we do have to praise it for its quite sturdy build and relatively low weight (it beats the Alienware 17, MSI’s TITAN PRO and Acer’s Predator 17 X by at least 1 kg). Unfortunately, the touchpad constantly reminds you of that cheap feeling we talked about. The keyboard doesn’t make it look better either – it’s comfortable for typing with clicky and pleasant tactile feedback but the rather short travel, the lack of macro keys and unisolated arrow keys don’t fit the high-end gaming profile of the machine. And even if we sound harsh at times, it’s because the price tag of the laptop allows us to be – charging more than $2 000 for a laptop will definitely draw some nitpicking criticism. Fortunately, not all is bad. 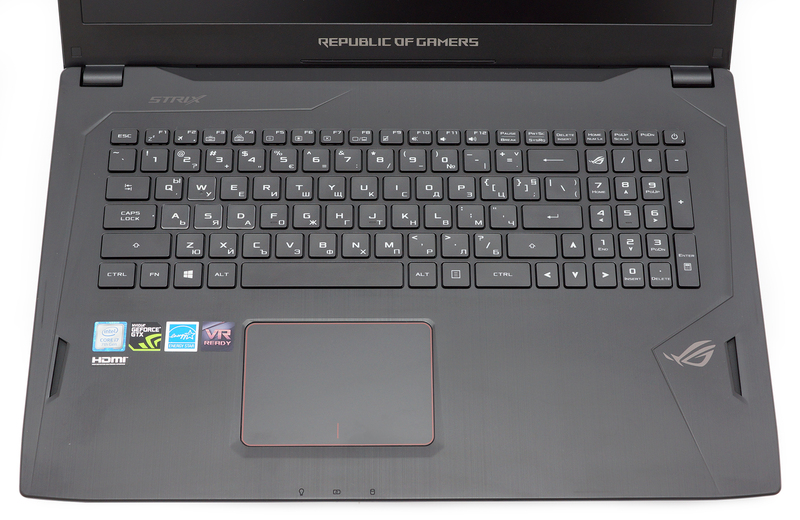 In fact, the most important features of a gaming laptop are preserved. The cooling system is excellent – provides good enough airflow for the massive hardware, although at the price of noise emissions, and keeps the interior cool. The display is also one of the best we’ve seen – with the Predator 17 X coming only with 1080p @ 75Hz or 4K @ 60Hz (because the notebook hasn’t received a refresh for a while now) and the Alienware 17 R4 running a QHD VA panel at 120 Hz, it’s easy to say that the ASUS ROG Strix GL702VI has one of the best gaming-oriented screens out there. Not only it’s an IPS but also supports G-Sync and runs at buttery-smooth 120 Hz. We only wished the notebook cost just a little less than the current GTX 1080-powered competitors. Hello! I need your advice, how do you think this laptop will be suitable for work with 3DMax and graphic editors? For me very important the screen.